Depending on what plugins you have installed, you will be able to get access to the intellisense features that Eclipse offers. By saying plugins I use that term loosely to speak about the various Software Development Kits (SDK) or in the case of Java, the Java Development Kit (JDK). 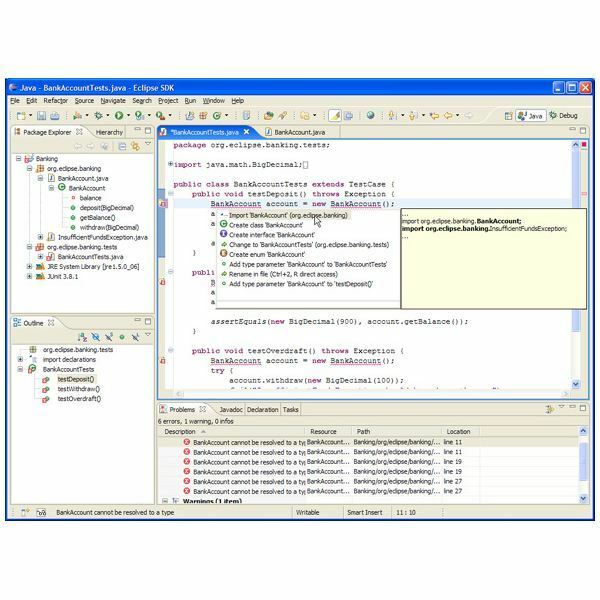 These allow the Eclipse user to have insight into the Application Programming Interface or API to get a dynamic reference and to be aided in what syntax is correct and what phrasing is allowed for a particular language or framework. Debugging on the same languages is handled within the IDE and therefore this reduces the amount of time you would actually spend producing software. The debugging on Eclipse is fully customizable allowing you to be able to set what type of errors need to treated as mere warnings or how critically you want them treated. Compiling and deploying applications is made easy throughout the project settings dialog where you can set up various targets for your application. So for example you can deploy to mobile platforms or to a desktop and the IDE will handle the details for you. Other features that you get with Eclipse is the block hiding and commenting to make it easier to manage your source code when it starts growing longer. Working in teams using Eclipse is also easy in that it supports source control through various services such as GIT, SVN, CVS, Bazaar and others. All this can be configured easily using appropriate wizards and configuration dialogs. Eclipse’s strengths are built on its plugin architecture which we take a look at next. Eclipse IDE thrives in its ability to be extensible. It can be extended by installing plugins that can be customized by experienced developers. The extensibility of Eclipse is evident in the proof that there are quite a number of versions of Eclipse that have totally different functions such as mobile development, desktop development, server J2EE programming, Carbide.C++ for Symbian development and so on. The ability of Eclipse to thrive on plugins has spawned several other third party applications such as Aptana Studio and Carbide.C++ among others. Eclipse does really well as far as stability goes and this remains true across all the available platforms. Eclipse may not be as comfortable to use especially if you have an old piece of hardware or just in case you do not have enough memory on your computer. This is because Eclipse consumes quite a bit of memory so as to be able to function well especially with functions to do with intellisense. That again is not an issue if you have relatively modern hardware which can be able to quickly process the extra work that Eclipse does to make things easier for you. One of the reasons Eclipse consumes quite a huge amount of memory is because it works really hard in the background just to make it easy for you to concentrate on your programming and to increase your productivity. New users to Eclipse will find it relatively easy to pick up and dive right into writing software code without having to dig through huge manuals. Any computer literate person should be able to pick up Eclipse without a problem. I would definitely say that Eclipse is a great programming IDE in that it is capable of doing so much in different languages and frameworks, all the while remaining stable. It may not be very exciting to fathom the amount of memory it uses but it is definitely worth all the memory it requires just so it can make life easy for the developer. You may download Eclipse for Free from this link. Read more on Developing for Google Android with Eclipse here and find out more on Eclipse for Visual C++ Developers here.